Dancing in Cambodia, At Large in Burma (1998) is made up of three parts: the two longish travel-essays of the book's title and a shorter Cambodian piece, "Stories in Stones". Ghosh's capacity to find patterns in apparently unconnected events is at its best in "Dancing in Cambodia", which links the 1906 visit of Cambodia's King Sisowath, his entourage, and a troupe of Cambodian classical dancers, to France, with the recent history of the country decimated by the Khmer Rouge Revolution. Ghosh interviews a number of figures who provide living testimony to the interconnectedness of these two narratives. They include a famous dancer, Chea Samy, who has first-hand knowledge of King Sisowath and his daughter Princess Soumphady as a result of having been taken to the royal palace in 1925, at the age of six, to be trained in classical dance under the supervision of the Princess. She is also - and the matter-of-fact manner in which Ghosh records this makes the revelation all the more chilling - Pol Pot's sister-in-law. Palace revolution and the French connection are motifs that run throughout the essay. Pol Pot was himself taken into the palace at the age of six. Pol Pot appears to have been radicalized during his time as a student in Paris. He particularly admired Robespierre, basing the ideological purity of his genocidal regime on the French revolutionary's belief in the virtue of Terror. Similarly, the grandson of King Sisowath's Palace Minister, Thiounn, becomes a central figure to a generation of Cambodian students in Paris and one of his prote'ge's is Pol Pot. For the most part Ghosh documents these connections neutrally, but lest they be missed, he does comment at one point that coups usually begin in the courtyards of the palace. King Sisowath and Pol Pot may seem polar opposites, but with their common experience of palace life and their enthusiasm for certain, albeit different, aspects of French culture, they emerge as curiously twinned. In the period of reconstruction after Pol Pot's fall, the return to normalityis associated with an art form that has palace associations: Cambodian classical dance. The text represents dancing as far more than a traditional Cambodian performance art; it becomes a trope for the indestructibility of the middle-class culture threatened with extinction during the Pol Pot era. The essay ends with an "epiphany" in Phnom Penh in 1988, a moment when grief and joy commingle, as classical music and dance are performed once again for the first time. On this occasion, then, the humanist conclusion is not so much championing subaltern survival, but the resilience of an educated class threatened with extinction by a Western-inspired regime, which has declared war on the intelligentsia. "Stories in Stones" considers the iconic significance of Angkor Wat, reputedly the largest religious edifice in the world, as a symbol of Cambodian identity. The essay wryly reflects that its omnipresence as a talismanic object pervades virtually every area of the nation's life - except religion. Ghosh's illustrationof the proliferation of images of the Wat in a range of commercial contexts is not, however, simply evidence of the extent to which tradition and modernity overlap; it is a striking instance of a modern appropriation of an older tradition, which he sees as eroding the humanist possibilities of earlier belief-systems. "At Large in Burma" provides insights into an Asian country that has been particularly isolated from the outside world in recent years, again doing so through the medium of individual stories. Here the central figure is the leader of the country's democratic movement and winner of the 1991 Nobel Peace Prize, Aung San Suu Kyi, whom Ghosh first met while a student in Oxford in 1980 and whom he now interviews during two visits in 1995 and 1996. At one point he mentions having been brought up to believe that the public and the private should be kept separate, with the corollary that it is wrong to reduce political movements to their leaders, but he finds Aung San Suu Kyi the personification of Burmas democratic resistance. 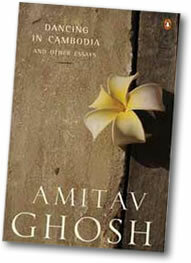 So, in addition to providing a window on one of the world's more closed societies, the essay becomes another instance of Ghosh's characteristic historiographic method of illuminating national and communal issues through personal stories, though, as in "Dancing in Cambodia", it departs from his earlier focus on subaltern experience. "At Large in Burma" also contains a section in which Ghosh travels to the Thai border in an attempt to understand the independence struggle of one of Burma's many minorities, the Kanenni. Naipaulian ironies emerge when tourists visit refugee camps to see the Kanneni's long-necked giraffe woman, oblivious of their history of oppression and displacement and unaware that they are commodified versions of the rural simplicity they supposedly represent. Ghosh's own perspective is, of course, much more complicated and again centrally concerned with the impact of modernity. His main interest lies in trying to assess what freedom means to the Kanneni and whether the utative nations around Burma's borders would be better off as separate states. His consideration of this issue revisits the central motif of The Shadow Lines and he once again comments on the arbitrariness of borders drawn by colonial officials and the inevitable artificiality of nations. His conclusion in the case of the Kanneni, and the sixteen or so other potential nation states around multi-ethnic Burma's borders, is that they would not benefit from being separate countries. So, like so much of Ghosh's work, this part of the essay presents a self-contained micro-history of a group, which can also be read as a metonym for a larger global debate. It holds a mirror up to late twentieth-century cultural theory on the nation state, which both reflects and reverses commonly held assumptions when it suggests that in the case of the Kanneni the historical borders are probably best left unaltered.